Troll of the Trollshaws. Tom was large, fat, and rather insipid. He, along with his friends Bert and William Huggins, were Stone-Trolls, meaning they turned to stone in sunlight. The three enjoyed eating men, Elves, Dwarves, and wizards. They had a bad habit of arguing over which way to eat their meals. Sometimes they liked baking them, frying them, roasting them, boiling them, or even eating them raw, and a lot of times alive. During the Quest of Erebor, Bilbo Baggins and a company of Dwarves encountered the Trolls. Bilbo, testing his burglary skills, tried to pick-pocket William Huggins. 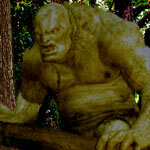 The trolls then became aware of their presence and put all but Bilbo into sacks. They then asked Bilbo what he was. He identified himself as a burrahobbit. Tom argued with his friends about what this was. Then they argued about how to cook and eat the hobbits. Gandalf tricked them into arguing all night and they were turned to stone.